Hitler's foreign policy should not have been a surprise to students of Mein Kampf. When you studied the League of Nations, you learned that it had two great failures in the 1930s - Manchuria (1931) and Abyssinia (1935). However, by far the greatest disaster for the League (although pupils usually forget to mention it in their essays!) was the failure to stop Hitler (1933–39). These pages study this, the League’s greatest failure. Hitler was determined to destroy the League, and it is doubtful if anything could have saved it. Danzig was under League of Nations control. The Treaty was a constant reminder to the Germans of their humiliation in World War I. Hitler did not accept that the German army had lost the war, and he was determined to make Germany great again. Mein Kampf (a book written by Hitler, 1924). The German population was growing. Hitler said that the German nation needed more Lebensraum (‘living space’) . He was determined to get Lebensraum by conquering land in eastern Europe. This was connected with his belief that the Aryan race was genetically superior and destined to rule over others. Hitler believed he had the right to invade eastern Europe and make the Slav peoples (such as the Poles and the Russians) Germany's slaves. It will be the duty of German foreign policy to get large spaces to feed and house the growing population of Germany. Destiny points us towards Russia. The Nazis were Fascists: the exact opposite of the Communists who ruled Russia. Hitler blamed the Communists for Germany's defeat in World War One, and he feared that the Communists were trying to take over Germany. He was determined to destroy Communism, and this meant a war with Russia. The menace of Russia hangs over Germany. All our strength is needed to rescue our nation from this international snake. This cartoon by the British cartoonist David Low appeared in the Evening Standard newspaper on 9 September 1938. Hitler on the left, in front of a Nazi flag, waving a sheet of paper marked 'The Idea. All Germans everywhere are mine'. 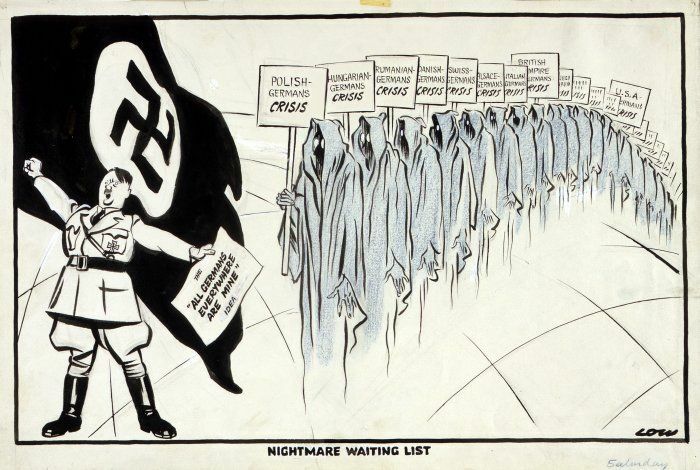 Behind him stands a long line of ghostly figures, each carrying a placard marked 'Polish Germans - Crisis', 'Hungarian Germans - Crisis' etc with 'British Germans' and 'U. S. A. Germans' further down the line. Match Sources A-3 to Hitler's aim (1-3). Which source illustrates which aim? 1. Study Source D - it suggests a further motivation of Hitler's foreign policy (pan-Germanism). What does it suggest on the surface that Hitler was trying to do? 2. Understanding the meaning of the cartoon, did Low really believe that pan-Germanism was one of Hitler's motives?